The club makes an annual donation to the Catalina Hyperbaric Chamber. Last year, we were able to donate $5,000! We are excited to match our donation again in 2019. Taken in the 1970s, this picture is reminiscent of AVDD’s signature patch. Divers in the desert? Of course! 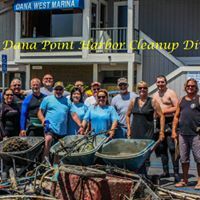 Proud divers standing next to the trash pulled out of the ocean at the Club’s annual June Lake Cleanup Dive. Club’s annual Clam Chowder Dive. Fantastic beach diving followed by delicious homemade clam chowder. We are a club that dives! A group of us after one of our club dives off of Casino Point in Avalon, CA (Catalina Island). April 6, 2019 volunteer luncheon at the William J. “Pete” Knight Veteran’s Home in Palmdale, CA. A group of volunteers cooked and served lunch, spent time with our honorable veterans, and generally had a great time. Gorgeous fish and kelp photo taken by one of our divers off the coast of California.